A 1939 red-lined map of L.A. from the HOLC, a government agency created after the Great Depression. Maps like these were used to deny home financing to non-whites. The Westside and Downtown are linking up to create a contiguous zone where only wealthy people can afford to live, expanding into areas that have historically been populated by lower-income communities of color, predominantly Black and/or Latin@. What’s already happened to Silver Lake and Echo Park is proceeding full-steam ahead in places like Crenshaw, South Central, Boyle Heights, and Inglewood. The orange outline is the contiguous area being colonized by the rich. The shaded region contains areas historically populated by Black and Latin@ communities. Each colored pinpoint represents a neighborhood, as follows, starting from the top of the shaded area: Echo Park/Silver Lake is purple. Downtown is black. Boyle Heights is green. South Central is yellow. Crenshaw is red. Inglewood is blue. Some figures related to our housing crisis are well known: L.A. has 58 billionaires and 58,000 homeless residents. Rents have become totally detached from wages, increasing by 32% since 2000 while median income has fallen by 3% over the same period. As evictions skyrocket, Los Angeles was recently voted the number-one site for real estate investment in North America (lucky for us, L.A. “still has room for rents to rise”). But what is less well understood is how this crisis is devastating specific communities of color across L.A., and changing the spatial apartheid of the region. This isn’t exactly new. The Westside has been almost exclusively white and rich for the last several decades — segregated by race and class, that is. What I’m describing can be seen as an extension of that existing residential pattern. But it’s happening rapidly, and on multiple fronts at once. Now I’ll go into some detail on several different neighborhoods to give a quick look at how this is happening, with links for further reading. South Central, majority Black in the immediate postwar period, has more recently (in the 1990s) become majority Latin@: these days its population is 87% Latin@ and 10% Black. It is the most over-crowded neighborhood in the country, has a poverty rate of 45%, and 8-in-10 residents are renters. Of those who rent, almost 70% are forced to spend more than 30% of their income on shelter. Clearly, most of the locals would have a very difficult time handling a rent increase. But that’s exactly what has happened in recent years, and rent increases are expected to accelerate even further in the immediate future. The continued expansion of USC, high-profile mega-developments like this $1.2 billion luxury apartment project called ‘The Reef,’ South Central’s proximity to the LA Metro Blue Line, and years of disinvestment that have resulted in cheap land all combine to make this Downtown-adjacent neighborhood a perfect target for real estate speculation (betting on rising property values) and trendy white folk. South Central already experienced a 44% increase in homelessness in 2015-16 alone. A report published by Human Impact Partners, jointly with several other organizations, estimates that 4,445 renters within a ½ mile of The Reef development face a high or very-high risk of displacement by the project, and an additional 39,311 renters within 2 miles face a moderate risk. Fortunately, there are groups like Strategic Actions for a Just Economy (SAJE) and UNIDAD struggling against this every day. Check out this article by Sahra Sulaiman from StreetsBlog LA, and the report mentioned above, if you want to read about South Central in greater depth. The population of Crenshaw is overwhelmingly Black, and roughly 7-in-10residents rent. Nearby, Ladera Heights is referred to as the ‘Black Beverly Hills,’ which remains a majority Black, relatively wealthy neighborhood. But the median incomes in the majority of census tracts in the area overall range from $20,000 to $40,000. In 2015, the income needed to afford the average market-rate unit in L.A. was $105,000/year — double or even quadruple what most families there make. In a win for some homeowners, but a big loss for the majority renter population, property values have jumped by more than 40% in just a few years, and rents along with them. The major process fueling this speculation is the construction of the Crenshaw light-rail line, which will connect the area to both Downtown and LAX. But there’s also the proposed redevelopment of the Crenshaw Mall by a Chicago-based company looking to add 1,000 market-rate (read: luxury) housing units and 400 hotel rooms, in addition to severalother upscale projects planned along the Metro line that represent a further surge of investment, and are a good indication of the gentrification to come. Residents and Black-owned businesses have already been struggling against displacement for several years now, and there’s every reason to expect this will continue apace as the transit line is completed, set for 2019. Crenshaw Subway Coalition, led by Damien Goodmon, is currently organizing against the mall redevelopment project. For more information, read his analysis here, in addition to another great piece by Sahra Sulaiman. Boyle Heights is a heavily Latin@ neighborhood just east of Downtown, in which more than 7-in-10 residents are renters. The median income is $33,235, and over 9,000 households there earn under $20,000/year. Between 2010 and 2016, the median rent in Boyle Heights jumped from around $1,500 to $2,200 — a $700 increase in just 6 years. As I write this, actual Mariachis are being evicted from a building set to be named “Mariachi Crossing” by BJ Turner, the property owner, for the explicit purpose of making way for wealthier tenants. Boyle Heights Alliance Against Displacement (BHAAD) — a coalition made up of groups such as Defend Boyle Heights, Union de Vecinos, and the Eastside local of Los Angeles Tenants Union (LATU) — has been organizing against this for a while now. For more details, here’s one of several analyses from BHAAD on the situation there. Inglewood, a heavily Black neighborhood since the 1960s, has more recently become roughly half Latin@. Considered a haven for the Black middle-class, it’s slightly wealthier than the other neighborhoods mentioned here. Nonetheless, there are good reasons to be concerned about displacement on a massive scale, as over 10,000 households earn below $20,000/year, and 6-in-10 residents are renters. Inglewood real estate is considered very hot right now, which you’d already know if you watch the show Insecure. The average selling price for an Inglewood apartment has almost doubled since 2012, while average rents have increased from $1,000 to $1,350 over the same period. It’s a prime spot for real estate speculation because it’s pretty close to many jobs on the Westside. The $2 billion NFL stadium project, in addition to the renovation of The Forum and the construction of the Crenshaw/LAX light-rail line are also sure signals that Inglewood is being primed for wealthier yuppies. Uplift Inglewood has been organizing steadily to protect residents from displacement, to “uplift, not uproot,” in their words. There’s also a good episode from the podcast There Goes the Neighborhood about gentrification in Inglewood. 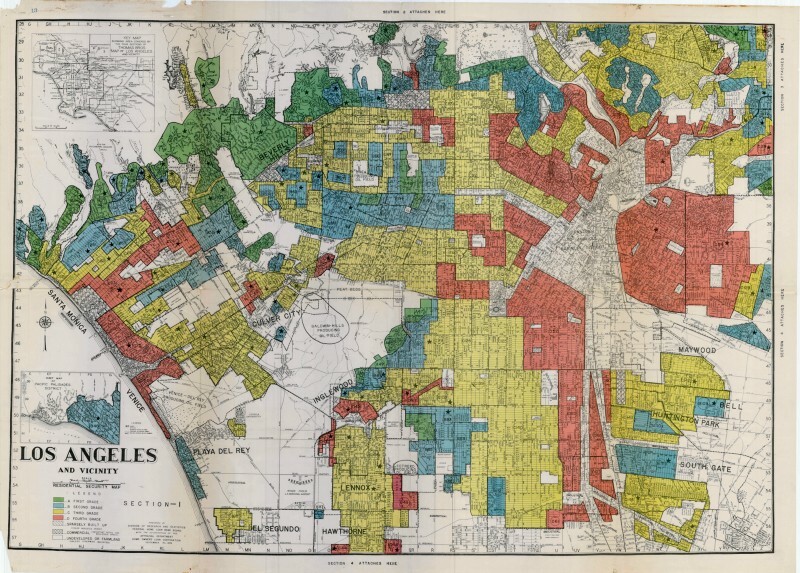 Finally, a quick caveat regarding my arguments here: mapping and tracking displacement and demographic changes is a very tricky task, especially in a place as big and diverse as L.A. I am not prepared to defend the claim that all of Los Angeles (City or County) is becoming exclusively rich and white, and this is further complicated by the fact that many people of color do actually have enough money to live wherever they please. I also do not mean to erase the different Asian-Pacific-Islander communities of L.A., but these communities are outside my area of expertise — so my apologies if I’ve at times broad-brushed these neighborhoods or otherwise glossed over important nuances of the issues here. At the end of the day, though, it’s still undeniable that many different centrally located parts of L.A. are all simultaneously being cleansed of poor people, who are overwhelmingly Black and Latin@.